Black Friday 2018 deal: Save over £100 on Vifa's Oslo wireless speaker | What Hi-Fi? 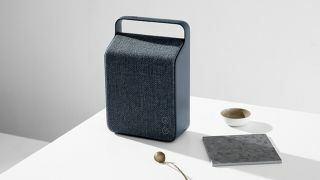 We’d forgive you for not having heard of Vifa - after all, the Danish brand is competing in the increasingly dense wireless speaker market alongside huge brands like B&O, Bose, Sonos and JBL. And has been for just six years. But we’d argue the brand deserves to be known. In the past year we’ve had the pleasure of welcoming two of its wireless speakers into our test rooms, and both have walked out of it with an admirable four stars for their ‘Scandinavian je ne sais quoi’ (or weighty, insightful sound and strong build, in layman’s terms). That’s why Amazon’s deal on the Vifa Oslo (green variant) has caught our eye. The retail giant is offering 24 per cent off the Bluetooth speaker, reducing it from £426 to just £323 - a saving of just over £100. That figure may seem pricey for a Bluetooth speaker considering many others offer wi-fi streaming and voice control – and to some extent it is – but for those that value portability and design (it looks very strokeable) as well as sound quality, we doubt from the brand’s track record that it would disappoint. It marries Bluetooth 4.0 with NFC for one-tap pairing, features a 3.5mm input for wired connectivity to a source device, and houses two 50mm full-range drivers and two 65mm woofers sit inside its 2.4kg form. The deal is available now and runs until November 27th.